Our practice is committed to bringing the safest and highest quality of care to our patients. The installation of our new digital X-ray system continues that commitment. 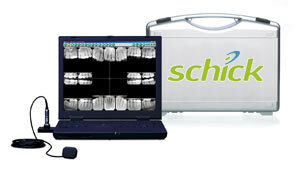 The state-of-the-art Schick system enables us to provide greatly improved diagnostic capabilities to our patients while significantly lessening their exposure to radiation by up to 80 percent over the old film X-rays. We know this will be very important to many patients. The x-ray on the left is not digitally enhanced. 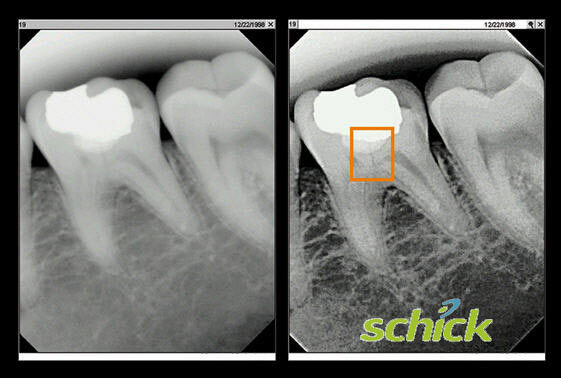 The x-ray on the right is digitally enhanced.If you look closely inside the orange box you will see a crooked vertical line.This line represents a fractured tooth that is unrestorable and must be extracted.It is this type of detail and information that we are able to view with digital x-rays.